Today we are looking at a pretty rare bass. It is a Peavey J-84 Liberator bass, made by the Peavey Custom shop, and endorsed by John Taylor of Duran Duran. This bass was designed and built to John’s specifications, with custom black hardware and Juicy Couture graphics. It is a 34” scale bass with 21 frets on its bolt-on neck. It has an ebony fretboard. The electronics are Peavey custom shop active electronic humbuckers. First-class stuff all the way. 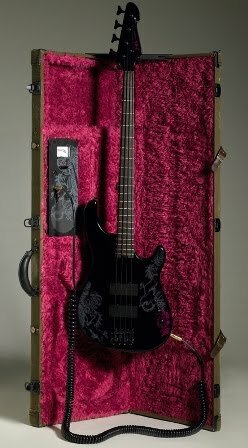 John Taylor and Juicy Couture (which his wife owns, IIRC) also came up with a great case and accessory package to go with this bass. The custom case has a bass hanger and an integrated amplifier/tuner unit. There is also a custom strap, and a canvas goodie bag with a custom cord and a pick. And, of course, there is a certificate of authenticity signed by John Taylor, stating that this is number 29 of only 100 that will ever be built. So, with Duran Duran’s worldwide popularity, these were instantly collectible, which also made it an unwise business decision to actually play the thing. The only bad thing about these basses was that you could only buy them through Neiman Marcus. For a company that charges a premium for what is supposedly the best service around, they really dropped the ball on this one. The sales representatives knew nothing about these if you called up to ask them questions. Then the nightmare of constantly changing delivery dates began. Eventually it did show up, though. Wow, I had never even heard of these. It is kind of a cool package, but strange that it only was available through Needless Markup. I bet the NM folks were pretty bad on customer service when it came to product knowledge on the private submarine they used to offer, too.